Inaugural lecture with Professor Marie-Pierre Moreau, Faculty of Faculty of Health, Education, Medicine and Social Care. Inaugural lecture with Prof Christopher Land, Faculty of Business and Law. 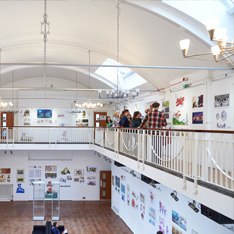 The Cambridge School of Art Degree Show 2019 represents the culmination of the students' work here. They have studied with us for three years, and will be taking their talents out into the world.